For your consideration! The Oscar race for 2017 is already heating up. Check out some early contenders at this year’s FHS Film Festival! As usual the films will be shown in the Gifford Pinchot Multimedia Theater at Peeling Back the Bark World Headquarters. What will be this year’s prize-winning film? Be sure to take our poll at the bottom of the post to decide who takes home the coveted Poisson d’Avril Award given to the most outstanding film of the festival! The holiday season is fully upon us, and we here at Peeling Back the Bark want to make sure your gift-giving needs are covered. Below we feature a few items suitable for all the hard-to-please forest history fans on your holiday gift list. Books are always a great option, and we would be amiss if we didn’t point out a new work co-published by the Forest History Society and Louisiana State University Press: Forestry in the U.S. South: A History. This book explores how, since the mid-twentieth century, the forests of the U.S. South have made significant commercial and environmental gains through collaborations between industry, universities, and government agencies. The history behind these alliances, the success of sustainable forest management, and the evolution of private forestry in the South are all captured in this book, which provides a fascinating and immensely detailed overview of the people and organizations responsible for the revitalization and long-term successes of southern forestry. Forestry in the U.S. South is written by FHS members Mason Carter, Robert Kellison, and Scott Wallinger. Wallinger was also a past chairman of the Forest History Society board of directors. Two other new books of note would not only look great on a recipient’s coffee table, but are well worth reading as well. The first examines one hundred years of forestry in Texas through the history of two influential state organizations. A Century of Forestry, 1914–2014: Texas Forestry Association and Texas A&M Forest Service provides an illustrated account of Texas’s forest history, detailing important events such as the founding of state and national forests, the establishment of a state tree farm system, developments in forest research, urban forestry initiatives, and the founding of the Texas Forestry Museum. The book also reveals how the Texas Forestry Association and Texas A & M Forest Service have transformed the state’s natural landscape. One hundred years ago, expansive stands of virgin longleaf pine had largely disappeared because of lumber industry practices, along with unsuppressed wildfires. Deforestation had also led to widespread soil erosion that was affecting the state’s streams and rivers. Into this vacuum of forestry leadership entered the Texas Forestry Association (TFA), which was established in 1914 to promote forest conservation in the state. TFA members, led by William Goodrich Jones, a banker turned conservationist, continued a decade-old quest to create the Department of Forestry, now called the Texas A&M Forest Service (TFS). With that, Texas became the first state in the nation to establish its state forestry agency as part of a land-grant college. Since their creation, TFA and TFS have worked to establish pine seedling nurseries, fire control projects, and state-administered forest areas. With its large format and attractive presentation, the book would make an excellent gift for anyone interested in Texas history or forestry history in general. Another new book that would be a natural fit for home display is Primeval Forests of Finland: Cultural History, Ecology and Conservation, by Petri Keto-Tokoi and Timo Kuuluvainen. This book celebrates the cultural and ecological importance of Finland’s natural boreal forests. Keto-Tokoi and Kuuluvainen open with a discussion of how we define a “natural” forest and how such forests cannot be viewed in absolute terms: environmental factors mean that forests have different and changing states of naturalness. The authors then delve into the role of the forest in Finland’s art and folklore and how it has served for centuries as a national symbol. In fights over forest conservation in Finland throughout the twentieth century, nature conservationists have proven to be effective even in periods of economic growth and development. The natural forests are treasured and widely considered too valuable to sacrifice for short-term economic gain. Nevertheless, conservationists and forest industry tussled over the protection of the North Lapland wilderness areas in the latter part of the twentieth century. The book’s visuals—the large, full-color photos, maps, and illustrations—and beautiful and engaging. Looking beyond the world of books brings us to several other gifts for those with an interest in forests and forestry. Artwork always makes a great gift, and you can’t go wrong with this John Muir Trail Print which would improve the look of any wall. The same image is also available on a t-shirt. For the distinguished gentleman on your list who loves wood products we suggest the following accessories. The Wood Tie and the Etched Walnut Wooden Bow Tie are both unique wooden fashion items not just for lumberjacks. For the beverage fan on your list we give you two unique ways to handle your beer and wine. The Lumberjack Beer Bottle Opener is an opener in the shape of an axe, with a real wood handle and a notch cut into the back for opening brew caps in the home or in the woods. For the wine drinker we offer the Lumberjack Bottle Stopper to seal your bottles with a tree stump topper complete with a small ax cutting into it. Party hosts may also like this Mango Wood Platter with Bark, providing a unique way to present appetizers or other items. You can further outfit your home with Tree Branch Candle Holders. These 3-tiered tree branch candle holders accent the glow of a candle to create the perfect rustic focal point for any table, mantle or counter top. For the lumberjack on your list with an unruly mane or beard, we suggest the Saw Comb. This attractive mini saw with a cherry wood grip can cut through even the worst of tangled hair. Schenck Documentary Now In Production! What began as a millionaire’s dream, a genius’s vision, and a forester’s labor is now being captured in a Forest History Society documentary film. 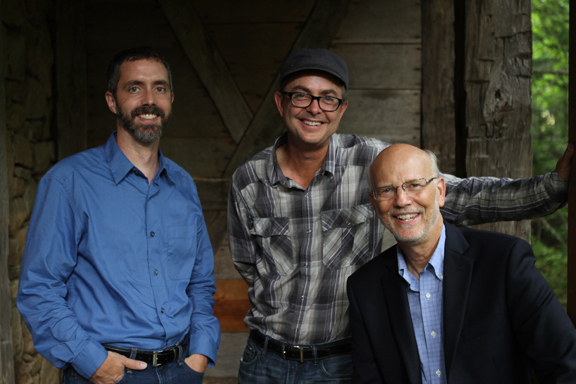 This spring the Forest History Society joined forces with Bonesteel Films to produce First in Forestry, a documentary film about Carl Alwin Schenck and the Biltmore Forest School. Principal photography for the interviews and re-creation footage began in earnest last month, and yours truly was there to witness the excitement and action, consult a bit, and try to look like I know what I am doing. 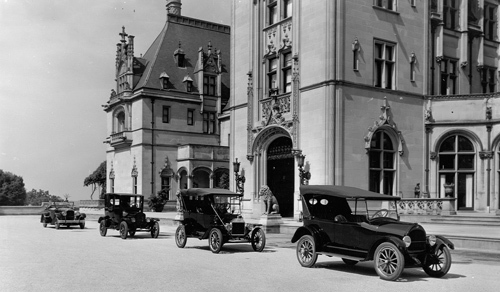 For those not familiar with our story, George Vanderbilt’s Biltmore Estate in Asheville, North Carolina, is where the first large-scale forest management effort was carried out in the United States under the direction of Gifford Pinchot and Carl Schenck. Schenck also established the first school of forestry in North America. 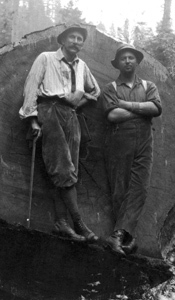 Several of the nearly 400 men who graduated from his school went on to become leaders in American forestry in the first half of the 20th century. 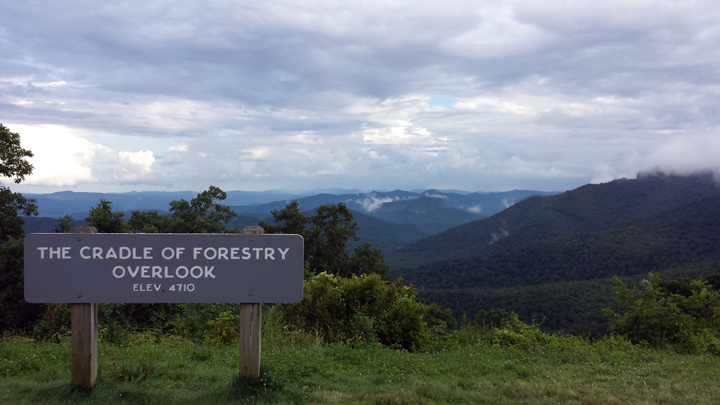 Much of the land they worked and learned on is now preserved as the Pisgah National Forest. The story of Carl Schenck and his work at the Biltmore is the focus of the film. Director Paul Bonesteel strongly believes that including re-creation footage will draw in today’s audiences, and we couldn’t agree more. He used this technique with great success in two other films that have aired on PBS, The Mystery of George Masa and The Day Carl Sandburg Died. Critical to that success is finding the right actors to portray historical figures, in this case, finding forester Carl Schenck (not Finding Forrester). We are fortunate to have the cooperation of the U.S. Forest Service and the Cradle of Forestry National Historic Site in making the filming possible. We’re using locations found throughout the Pisgah National Forest and at the Cradle of Forestry. As you might imagine, it takes a number of talented people behind the scenes to make the action in front of the camera look good and convincing. The folks at Bonesteel Films are top-notch and really pleasant to work with. Early calls and long days don’t dampen spirits. Not even a relentless rain storm stopped our filming interviews one day. We just moved to a new location. Fortunately, when it was time for shooting re-creation footage in the forest we had good weather. One of the things that excites us about working with Bonesteel Films is Paul’s skill in mixing traditional documentary film-making style (historical photographs and interviews with historians) with re-creation footage that works like a historical photograph brought to life. But without good interviews, the film could suffer. So we brought in one of the best at on-screen interviews, Char Miller. You may know him from such films as The Greatest Good and The Wilderness Idea. Not all of the film will be “talking heads” and re-creation footage. This is not just a story of the people, but the story of the place. 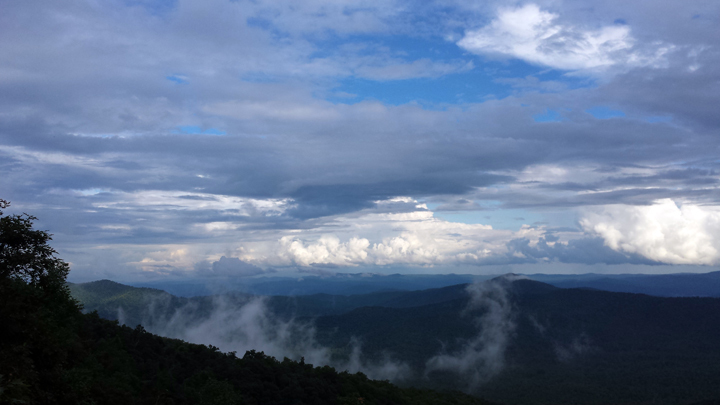 The Pisgah region and the Southern Appalachians are one of the most beautiful places in the world in my opinion. You can’t ask for a better backdrop for filming. It’s why so many Hollywood films are made there, too. For a few months now, whenever he gets a chance, Paul has been shooting footage that will capture and convey that beauty. 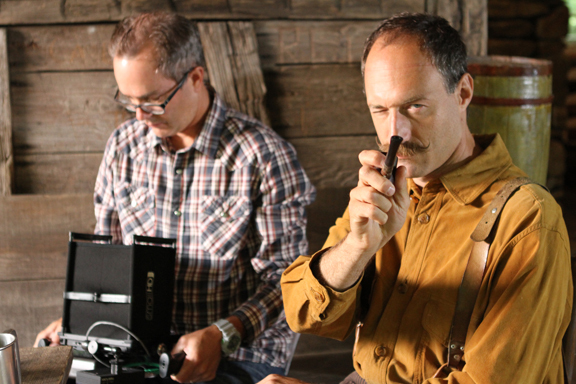 He has plenty of experience doing so because of his film about George Masa and commercial work for the Biltmore Estate. One of the things you often hear about with actors and film sets is how groupies sneak on to the set to watch filming. I’m hear to tell you it’s true. We’re going to beef up security for the next round of filming. We can’t allow set crashers who then peddle gossip to the tabloids. If you’ve read this far, thank you! If you want to be a part of forest history, we’re still fundraising for the film. Please visit our film page to learn how you can contribute, and stay tuned for more news on the film. This evening at 7 p.m. begins the 34th biennial Forest History Film Festival, brought to you by Axe Pine-scented Body Spray: “When you spend the day sitting in an office but want to be outdoors, why not smell like the outdoors?” Axe Pine-scented Body Spray is the official pine-scented body spray of the Forest History Film Festival. Below you will find posters of this year’s films in order of screening. We have a wonderful mix of comedy, drama, and horror films, including one that premiered this past weekend in theaters across the country. All films will be shown in the Gifford Pinchot Multimedia Theater at Peeling Back the Bark World Headquarters. What will be this year’s prize-winning film? Be sure to take our poll at the bottom of the post to decide who takes home the coveted Poisson d’Avril Award given to the most outstanding film of the festival! The Forest History Society is excited to announce that we’re developing a new documentary film. First in Forestry: Carl Schenck and the Biltmore Forest School will be the first documentary film to examine the pivotal role that the Biltmore Estate’s chief forester Carl Schenck and America’s first school of forestry played in American conservation history. It’ll be made in collaboration with UNC-TV and the Cradle of Forestry Interpretive Association for airing on PBS stations in North Carolina and possibly around the country. 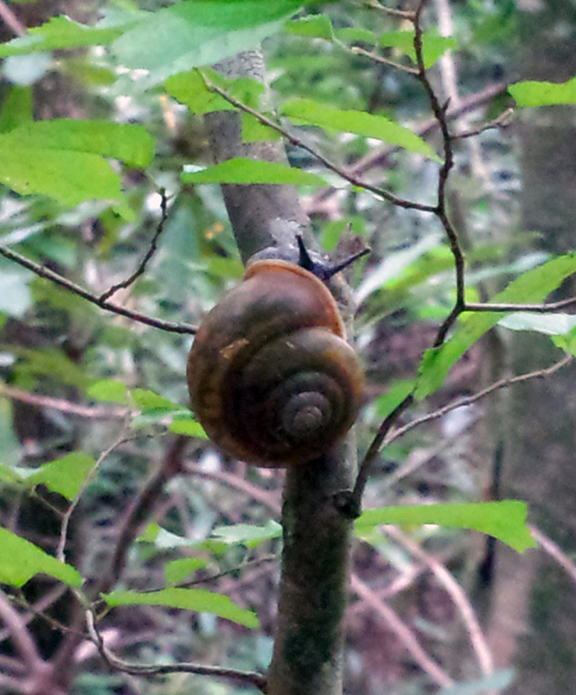 Why Schenck and the Biltmore Forest School? Established in 1898 by Schenck, it was the first forestry school in North America. Its 300-plus graduates were part of the first generation of foresters in America, many of whom became leaders in the conservation movement. And the Biltmore’s forests are the site of the first large-scale forest management effort in the United States, as well as the first land purchased under the Weeks Act. But even though the school and Schenck’s contributions to American forestry were considered important enough that the school’s buildings and grounds were preserved as the Cradle of Forestry in America National Historic Site a half-century ago, no documentary film exists about him or the school. Schenck tends to be overshadowed by his contemporaries Gifford Pinchot, Teddy Roosevelt, and John Muir in forestry and conservation history—all subjects of documentary films. Afraid that this will be a bone-dry, march-through-time history lesson? Fear not! At the heart of any good film is tension and drama, and the history of the Biltmore Forest School and its larger-than-life founder is a story spilling over with both. Think of it as forest history’s Downton Abbey. After all, it’s the height of the Victorian Era and Carl Schenck worked for one of the wealthiest men in the country at the largest private home ever built in the U.S. How’s that for a dramatic setting. Not dramatic enough? How about: He worked at a place built by robber baron money. No? Schenck was a hotheaded forester who didn’t shy away from a fight: He argued with Teddy Roosevelt over the future of America’s forests and he so angered Gifford Pinchot that Pinchot denounced him as an antichrist! Got your attention yet? When Schenck’s boss lied to him, Schenck punched him out and got fired! Soon thereafter, World War I broke out and Schenck found himself in the German army fighting against some of his former American students! So, you ask, when can I see this epic forest history documentary? That’s where you come in. We could trade on our good looks and charm to get this made, but, frankly, that won’t get us past the opening credits. So to help kickstart our fundraising for the documentary film, we’re excited to announce another first: Yours truly, The Mad B-Logger, aka, historian Jamie Lewis, has volunteered to run the inaugural From the Cradle to the Grave 30K Trail Race on May 18, 2013, and then the next day run the Biltmore Estate 15K—a total of 45 kilometers. I’m calling this effort “The Dash for the ‘Stache” in honor of Carl Schenck’s famous mustache. You can follow my training efforts on Twitter. Each of these races takes place on the land where Carl Schenck worked and made history. We’re suggesting a minimum donation of $45—that’s a dollar for every kilometer I run—with all proceeds going to the production of the film. Of course, any donation is welcome and appreciated. But why not get a little something for your money? To become a supporter of the film, visit our Donation page. As a thank-you for giving at certain levels, we’ve established a few incentives. We have a donor who has pledged to match every dollar donated at a 1:1 ratio, so the more you give, the sooner we can begin production of First in Forestry: Carl Schenck and the Biltmore Forest School. So please tell your friends and help spread the word. The New Swimsuit Issue Is Out From … Forest Echoes? That’s not Kate Upton on the cover. And that’s not Sports Illustrated. And that’s not even in color. That’s Miss Sally Johnson. And it’s the new swimsuit issue of Forest Echoes—well, “new” on the forest history temporal scale. It’s from 1947. And to be honest, it’s not really their swimsuit issue. So what’s going on here? 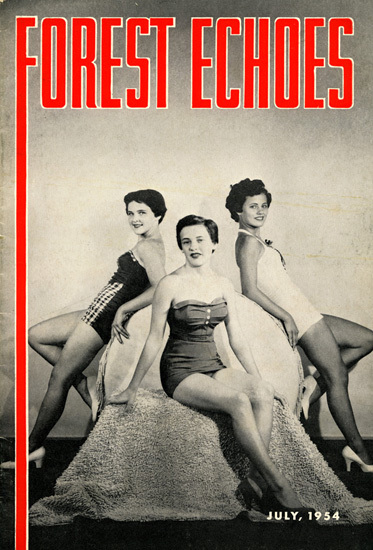 Forest Echoes was the monthly magazine published by the Crossett Lumber Company of Crossett, Arkansas, from 1939 until the company merged with the Georgia-Pacific Company in 1962. The company incorporated in 1899 and built the town of Crossett, which was incorporated four years later. The history of the company and the town are intertwined. Both are also closely linked to the Crossett Experimental Forest, which has a long relationship with the Yale Forestry School, often the source of some of the magazine’s humor (see cartoon below). 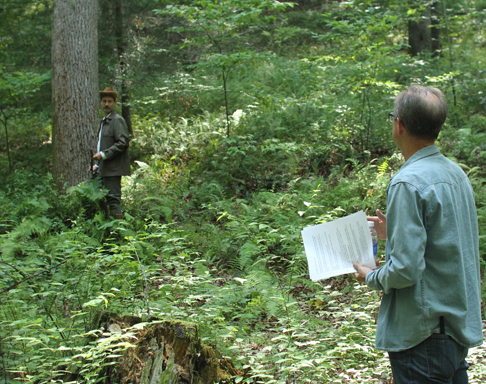 We’ll have an article on the history of the experimental forest in the next issue of Forest History Today. But back to Forest Echoes. What began as a mimeographed safety bulletin distributed by the company’s personnel division to some 1,500 workers in September 1939 quickly evolved into a slick little monthly magazine that contained personnel news, safety information, announcements of new technology and equipment, school events, and local events and programs like the Miss Crossett beauty contest, which Sally Johnson won in 1947. From the July 1947 issue of Forest Echoes. Sometimes they printed general education information on income taxes and social security, or on more mundane things like personal hygiene. This same issue included an article on the necessity of taking care of your feet and wearing good shoes because “a little advance foot care may save you many hours of pain and lost income.” Short works of fiction were also published. They had to be short: the magazine was 6″x9″ and on average just 16 pages per issue. The magazine also provided news about the African-American employees events in their community. Overall, Forest Echoes provides an excellent resource on the town’s history. The magazine is interesting from a historical perspective as much for what it says as for what it doesn’t say. Forest Echoes reflected what was going on in the national culture at the time in some ways, such as the beauty contests and community picnics and baseball games, while being selective about the news from the outside world. It was strictly about life in Crossett and Crossett’s view of the world, or at least that of the editors. During World War II residents were kept apprised of what the local boys were doing to win the war, and after the war an occasional article would appear on Crossett men who were in the National Guard. But the fight to desegregate schools in Little Rock in the 1950s is never mentioned and the magazine ceased operating long before the town schools integrated in 1968. It would have been fascinating to see how and if the magazine reported on the talks between the white and black communities about integration and the subsequent end of segregation. Another way the magazine sheds light on this era is through the humor published within. From the very first issue, lots of jokes were included. Initially they were scattered throughout the newsletter but eventually they were consolidated into a column called “Wind in the Pines.” The jokes are on par with what you’d have seen in Reader’s Digest then and even now—jokes about the work place, everyday life, and relations between the sexes. Often they depict a hobo or a working stiff putting one over on or giving comeuppance to the rich and powerful. Not long after the magazine started, a cartoon character named Abel Woodman appeared on the inside back cover. He typically gave a message about forest conservation or job safety but sometimes it was just straight humor. You can look forward to a “Forgotten Characters” post about Abel sometime soon. For now, here’s a taste. The presence of Yale Forestry School students every summer in Crossett gave the artist of Abel Woodman plenty of fodder over the years. At the outset I joked that the issue shown here was new. Well, it is new to us. It is through the generosity of David Anderson at the Crossett Public Library that we just received that issue. In fact, he sent us more than a hundred issues of Forest Echoes, which will go a long way towards filling out our collection of Forest Echoes in the library. Along with those, he sent copies of two histories of the town. So for researchers interested in Crossett Lumber and the town of Crossett who can’t get to Arkansas, come on down. As Sally Johnson might say, the water’s fine.